With average temperatures going above 30 deg C in the last couple of months, many are staying indoors to keep cool. Too much sun can damage the skin, causing spots or premature ageing. But there is still a way to get that healthy glow without the tan. 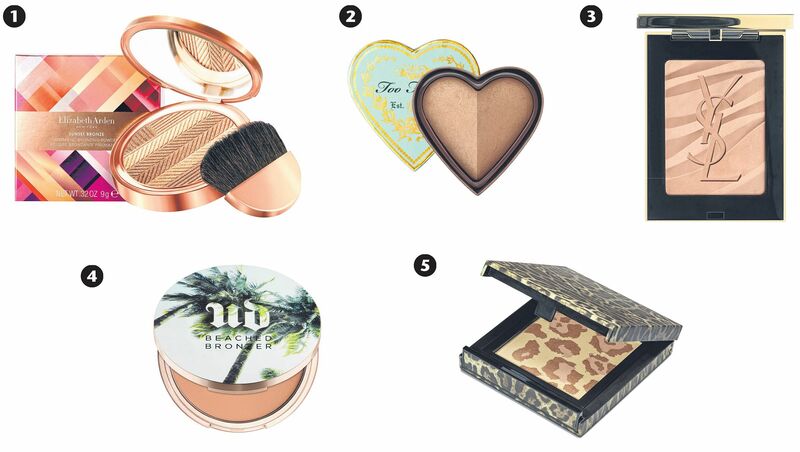 A good bronzer, strategically applied, can give the face a sun-kissed look sans skin damage. Choose a bronzer that is not more than one shade darker than your skin tone to keep the colour natural. The product should also be applied along the cheekbones and at the temples, areas where the sun would naturally hit the face. Use a fluffy brush to apply the bronzer, tapping off excess product from the brush before applying it to the face. This will help keep the look natural instead of making your skin appear muddy. This silky bronzer powder with a light golden shimmer diffused through the compact creates a subtle glow on the face. This two-in-one package allows users to either blend both colours together or use each separately. A smooth and finely milled powder that creates a sheer and subtle glow to the skin. The bronzer contains light-enhancing agents, which the label claims will add a luminous finish to the skin. A matte bronzer that applies smoothly without streaking. Try Sun-kissed, a light medium bronze with a hint of peach for a natural glow. The combination of bronze and pink gives the skin a healthy-looking glow. The shimmer in the product helps highlight and define features.